Light classical music rustles the spring leaves of a copse of trees standing “at attention” beside the modest Art Deco entrance to the Hilltop Hotel or the Yamanoue, as it’s locally known. I notice them because I come here often and I like the way they signal the season giving nature a place in the middle of Tokyo one of the world’s busiest and most densely populated cities. It’s 6 am and I’m the first arrival. Check in is 2pm but within 30 minutes they have my room ready, complete with a range of Japanese pastries and green tea. No, this is not an advertisement, it’s an homage to a wonderful, old-world hotel that takes service and its very particular history seriously. It has an unusual and interesting history that you vaguely feel when you enter. Built in 1937 it was, according to a one page handout, “a research institute of new life style for food, clothing and shelter, named Sato Sinkou Seikatsu-kan”. That leaves a lot to the imagination but I’m sure the founder, a Mr Keitaro Sato, would be pleased to know it now has 7 separate restaurants covering Japanese, Chinese and Western cuisines”, which vary completely in atmosphere and style. The Art Deco style has a way of making you smile wherever you find it, so amongst all the glitz and glamour of contemporary hotels The Hilltop is a time capsule of style and good taste. 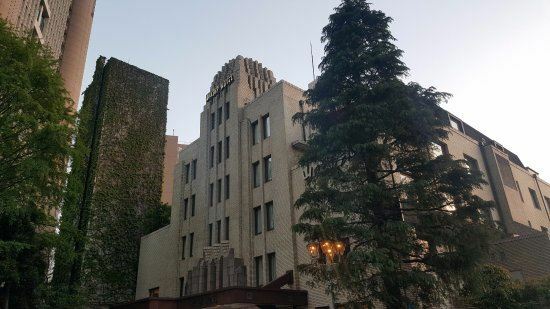 The architect, William Merrel Vories, who also designed the Daido Life Insurance Company Building in Osaka and the International Christian University in Tokyo, clearly knew what he was doing. And, there is another interesting historical detour. Vories, who became Merrell Hitotsuyanagi, was an educator, architect, entrepreneur, Christian lay missionary, and founder of the Omi Mission which developed “Mentholatum” an ointment for external injuries (would that be a snake oil?). Born in the United States, he later became a naturalized Japanese citizen. But for me, an erstwhile poet and prose writer, I’m attracted to its literary history. After its short stint as an Officers quarters for US Occupational Forces, it became in 1954 The Hilltop Hotel and was used by local publishers, who were prominent in the area, as a “literary prison” for some of their more recalcitrant authors such as Mishima Yukio and Ishizaka Yojiro,.This kept them close while they finished their manuscripts. The story goes that this is why there are so many restaurants and bars in the place so that they had no excuse to leave the building. My one page info sheet concludes with the brag that, “You can see even Mt. Fuji and the Chichibu mountain range in the distance when the weather is clear.” I don’t doubt them but so far I haven’t found the particular vantage point to confirm or deny the claim. In any case, there’s enough to see at ground level, good weather or not, to keep you occupied.